The research explored a novel modeling technique called joint species distribution modeling, which allowed the team to track the abundance and distribution of two species rather than just one, which is the more common practice in models of species' geographic distributions. Nina Lany, an Arnold and Mabel Beckman postdoctoral fellow led the study in collaboration with MSU spatial and community ecologist Phoebe Zarnetske and colleagues from the University of Missouri, Tufts University, Harvard University and the University of Rhode Island. "We analyzed the abundance of two invasive species as they spread across the landscape, instead of just one at a time in isolation," Lany said. "Most species distribution models correlate the occurrence of a single species with environmental variables only, leaving out an important dimension – their interactions with other species." "Studying interactions among species in this statistical fashion is uncommon," said Zarnetske, assistant professor in the forestry department. "Models usually just focus on one species at a time or on biodiversity as a whole, but rarely on how species interact together." 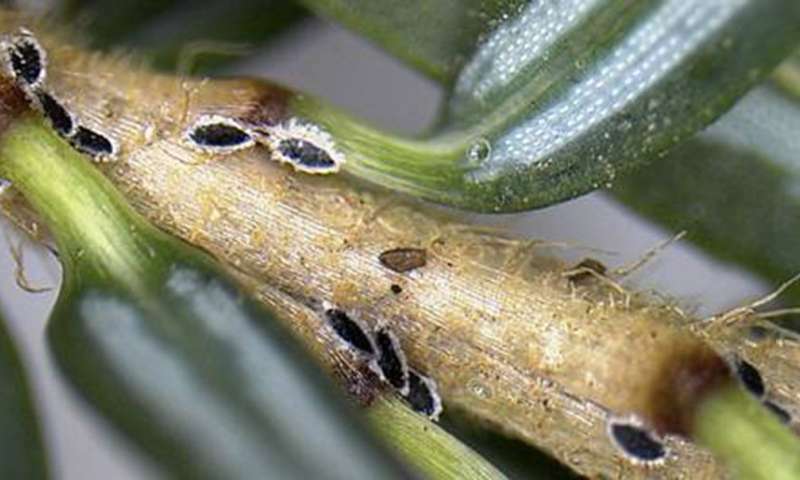 Lany and her team modeled a pair of invasive insect species, the hemlock woolly adelgid, or HWA, and the elongate hemlock scale, or EHS, both of which feed on the eastern hemlock tree. Using data collected in Connecticut and Massachusetts between 1997 and 2011 by colleagues at the University of Rhode Island and Harvard University, Lany and her team were able to study the populations of both insects over a considerable span of time. In studying the relationship between the two species, Lany found that HWA generally appeared wherever favorable environmental conditions occurred, but that its presence often led to an increase in a stand's EHS population. "On their own, hemlock woolly adelgids threaten to drive eastern hemlocks to extinction across much of their range," Lany said. "Seeing them interact so strongly with elongate hemlock scale gives us new insight into how invasive species spread." Lany's novel approach to the study of species distribution is already influencing future research. A new study funded through an approximately $350,000 Michigan invasive species grant, with further support from Project GREEEN, or Generating Research and Extension to meet Economic and Environmental Needs, and the Arnold and Mabel Beckman Foundation, will study the distribution of HWA in Michigan. "Now that we've worked through the methodology of joint species distributions, we can develop it further to address new problems," Zarnetske said. "This approach is preferable when trying to understand how species are distributed across the landscape because not only do they interact with their environment, they also interact with each other."